This is the third in a series of articles, released weekly, counting down the 10 greatest teams in the history of football. The teams were selected based on the trophies they won, the cultures they created, and the effect they had on the game of football. In the early 90s, the French National team that would eventually terrorize international football for a solid decade, could not even qualify for a major tournament. After missing out on Italia 1990, France saw a chance for redemption at the USA World Cup of 1994. After a shock defeat to Israel in a qualifying match played in France, the national team needed merely a draw to advance to the Coupe de Monde. Played on home turf in the Parc des Princes, victory was inevitable. Eric Cantona opened the scoring with a thunderous volley on the half-hour mark. His goal was canceled out a few minutes later by Bulgarian Emil Kostadinov. France kept their grip on the match until the 90th minute when midfielder David Ginola decided to ditch the plan to run down the clock and tried to press for another goal. His wayward cross into the box landed at the feet of Bulgarian left-back Emil Kremenliev. Bulgaria tore up the field as the final seconds of the match ticked off the clock. The Bulgarian’s worked the ball to Lubo Penev whose deft flick over the French defense fell into the path of Kostadinov. The striker collected the ball, took a touch, and sent his nation to the world cup with a booming shot that ricocheted off the French crossbar and into the back of the net. Redemption would have to wait. French football had deteriorated to its lowest trough. To pull themselves out, the French realized they had to reset their team’s structure completely. Following Germany’s epic collapse in the 2004 Euro’s, the “Deutscher Fußball Bund” implemented “Das Reboot” – the reconstruction of youth and coaching development. 10 years later, Mario Gotze would score the winning goal of the Brazilian World Cup Final, justifying Germany’s National Team reconstruction. France began their evolution by pushing aging players from the squad. The likes of Eric Cantona and David Ginola were uprooted from their secure spots in the team. This decision proved critical as it allowed a young squad to blossom, growing a brand new identity. In 1994 France established a new generation. French Euro Team of 1996 that featured their new number 10. Not everything was baguettes and Bordeaux, however. The National Team had to fend off a vicious, politically driven French media. 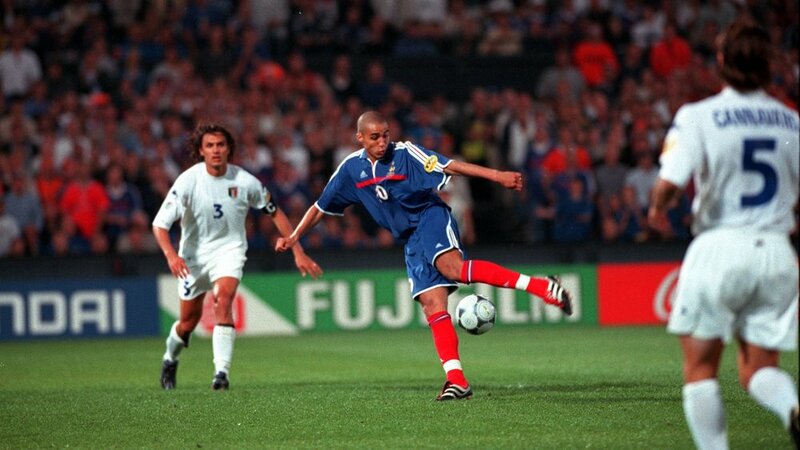 The French squad that developed in England in 1996 was held together by a desire to win and a fear of failure. Failure meant succumbing to the vicious French media that had hounded the team for the previous decade. To make matter worse, members of the media criticized the racial diversity of the French squad as the factor for the team’s recent failure. On the training pitch, Jacquet focused on developing a tactic that would showcase France’s strong backline while maintaining creative freedom for his young forwards. He settled on a 4-2-3-1. This formation allowed center backs Laurent Blanc and Marcel Desailly and defensive midfielders Emmanuel Petit and Didier Deschamps to establish a strong lower spine of the team. Most importantly, the security at the back allowed Zinedine Zidane to roam freely in center midfield surrounded by goal scoring options like Stephane Guivarch, Youri Djorkaeff and a 21-year-old winger named Thierry Henry. Henry entered the world cup with the difficult task of proving the hype that surrounded the wonderkid’s prolific start to his career at Monaco. Sound Familiar? 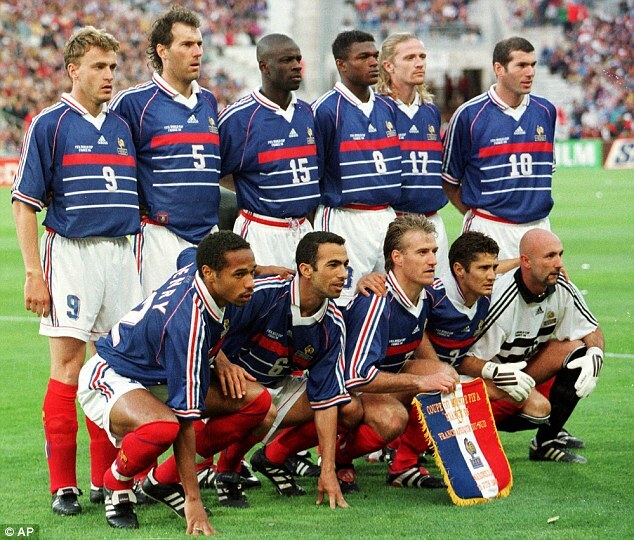 The 1998 French squad sporting one of the greatest international jerseys of all time. 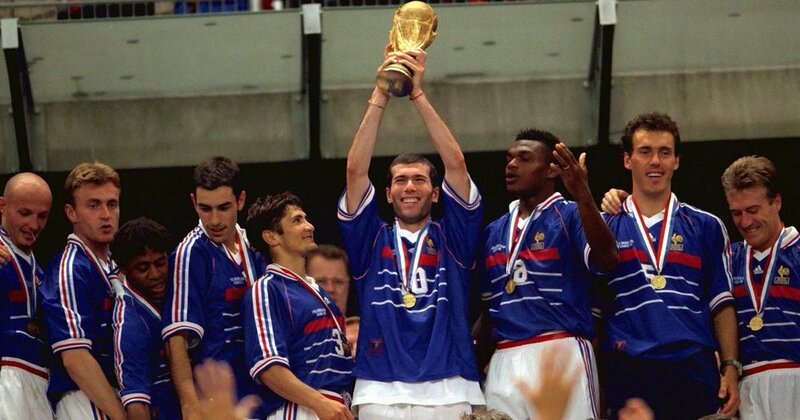 On June 10th, 1998, the World Cup began and, for the first time in over a decade, the French were back in the competition. France was given a break in their first group stage match, playing a weak South African side in Marseille – Zinedine Zidane’s hometown. With the overwhelming support of an enthusiastic crowd, France won the match 3-1. After two more comfortable wins in the group stages, France was slated to face Paraguay. 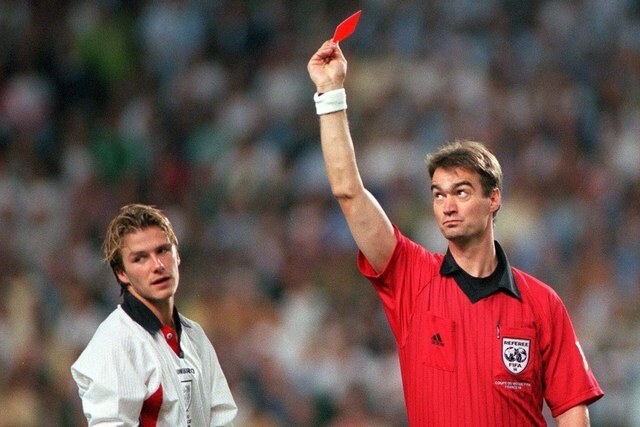 Against Saudi Arabia, however, in France’s second match, Zidane’s temper saw him stamp an opposing player, resulting in a red card. France would be without their magical midfielder until the quarter-finals. After 90 minutes, the scoreless match was taken to extra time. In France 1998, however, extra time meant the game would be decided by the knife edge decision of “golden goal.” Laurent Blanc took full advantage of this rule, firing a clean finish past the Paraguayan goalkeeper to send France through to the Quarterfinals where a highly anticipated matchup with heavy-favorites Italy awaited. A slow, defensive battle between two teams with equally strong backlines prevented any goals during the first 90 minutes and any golden goals during the extra 30. France’s fate would decided in penalties. The French, with their lethal strike force, had little to fear. Zidane, Henry, and Trezeguet made quick work of the shootout, relying on a di Baggio miss to tip the scales in France’s favor. The semi-finals would present a different sort of challenge. The French side that had struggled for goals in the opening knockout rounds would have to produce against a lethal Croatian team that had beaten European Champions Germany 3-0 in the quarter-finals. In the match that foreshadowed the World Cup Final that would follow two decades later, France soon found themselves in trouble. After going a goal down before halftime, right-back Lilian Thuram decided this match would be an excellent time to score both of the 2 goals that he scored for France in his 142 appearances for L’Equipe. In short, Thuram made sure he was right. He drew France level with Croatia scoring an unstoppable goal from a Djorkaeff pass. Thuram ponders his brilliant strike. On July 12th, 1998, France strode onto the pitch at the Stade de St. Denis beside the ultimate opponent, Brazil. The Brazilian side that had dominated the early stages of the knockout rounds - with galacticos like Rivaldo and Ronaldo scoring for fun versus Denmark and Chile - advanced to the Final after a nerve-shredding penalty shootout against the Netherlands. The French received extra motivation before the match when they thought they were the subject of some Brazilian mind games. Rumored to be out of the squad due to a series of convulsions the previous night, Ronaldo was not listed on Brazil’s original team sheet. With only a half-hour until kickoff, a new team sheet revealed that Brazil’s number 9 was not only back in the team but would be starting the match on the field. Not until after the game would the French learn that Ronaldo, in fact, had been seriously ill the night before and was in no condition to play a game of football, let alone the World Cup Final. For the moment, however, the French felt wronged. They set out determined not to let their golden opportunity slip away. France stormed Brazil, catching the South Americans on their heels. After Zinedine Zidane scored 2 goals before half-time, Brazil never looked like challenging. France had completed the most remarkable turnaround in international football history. After a decade of disappointment and despair, they had won the World Cup. The result shocked the country, sending crowds of French into the streets to celebrate. The country that had been the laughing stock of Europe for decades finally tasted victory. Their happiness turned to elation in 2000 when a similar squad proved in the Belgian-Dutch Euro’s that they could win away from home. After beating Spain 2-1 in the quarter-finals, France required a “golden goal” penalty from Zidane in the 117th minute to break a 1-1 stalemate with Portugal. Victory in the semi-finals set up a rematch of the quarter-finals from the world cup two years earlier. 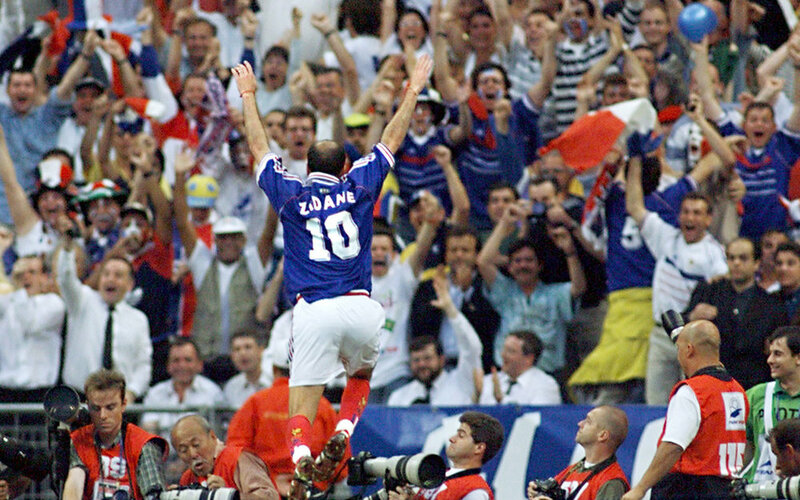 To win Euro 2000, France would have to beat Italy. Defensively, the Italian side of 2000 has few comparables from football history. With the duo of Maldini and Cannavaro protecting the Italian goal, the team that had only conceded twice in the tournament appeared an impenetrable force. The Italians executed Thuram’s strategy precisely after a Delvecchio strike in the 55th minute put them up 1-0. The Italians looked certain victors until, in the 3rd minute of extra-time, Sylvain Wiltord sent a pacy shot past Italian keeper Francesco Toldo to send the game to extra time. Golden goal proved friendly to the French once again when, in the 104th minute, substitute David Trezeguet sent a pass from Robert Pires into the roof of the Italian net. The French had completed the rarest of doubles. Trezeguet wins Euro 2000 for France. Their victory in the World Cup and in the Euro reestablished France as one of the great footballing nations. For a European country, there are only two possible trophy’s to win, and this French side won both. The team that had left Euro 1996 as a group of players still finding their feet were now presenting the Euro 2000 trophy as kings of Europe. Cementing their legacy as greats of the modern game, Thierry Henry and Zinedine Zidane became footballing idols. Were it not for an enraged headbutt against Italy in 2006, the French may have added another World Cup to their trophy cabinet. In 2018, however, France reclaimed their throne with a similarly young and diverse squad of immigrants and wonderkids. Both World Cup winning French teams proved to their compatriots the potential of their nation. France’s struggles to accept diversity in football existed long before 1998 and even seeped into commentary before Russia 2018. Victory, however, remains the ultimate defiance of hatred and vitriol.